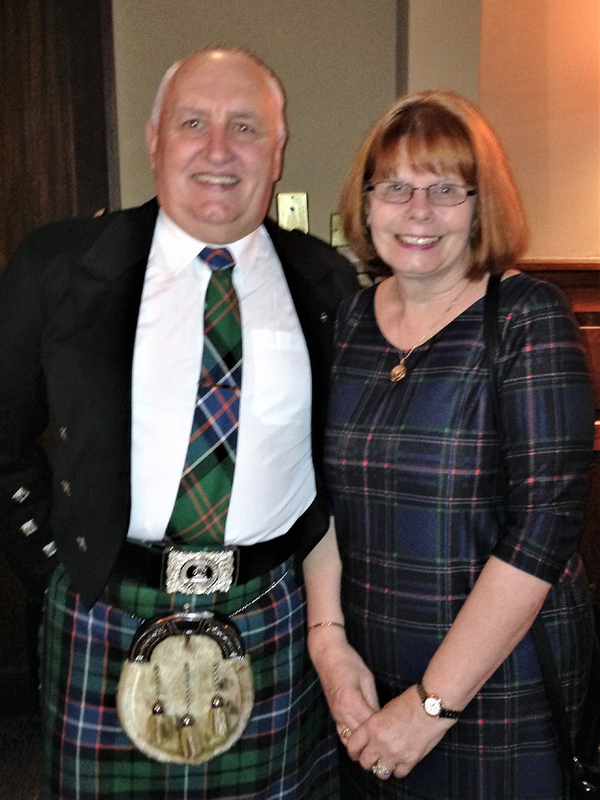 Around sixty members and guests attended our annual Burns Supper at the Savoy Park Hotel. Into the company of the (nearly) great and the (mostly) good, we welcomed surprise Canadian visitors John Hutchison and Margaret Watkins from Vancouver and Mary Johnston from North Lincolnshire. Piper Leslie Wilson and our favourite local group, Luath, provided the musical accompaniment and entertainment. 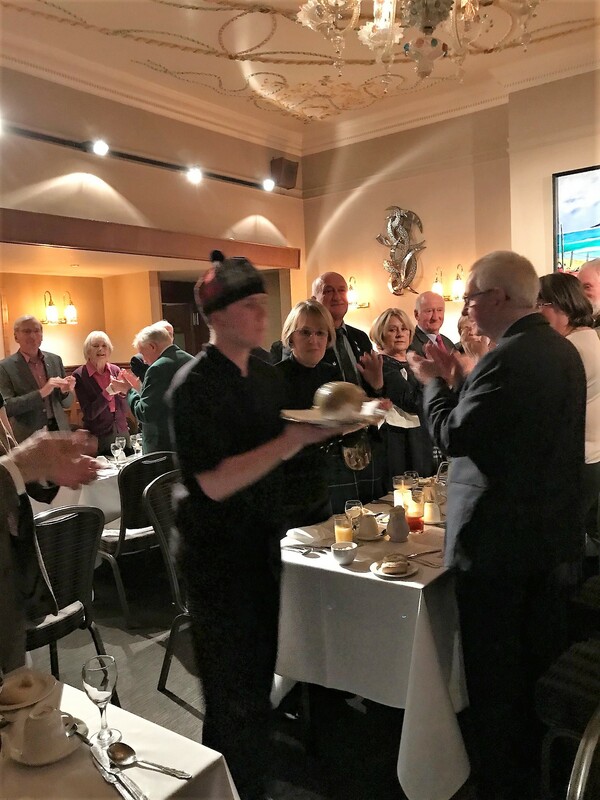 After the welcome from President Craig, the nicht’s boisterous ongauns began in the traditional manner, with Charlie Steel’s well-honed address to that renowned chieftain o’ the puddin race, and Colin Vooght’s Selkirk Grace. 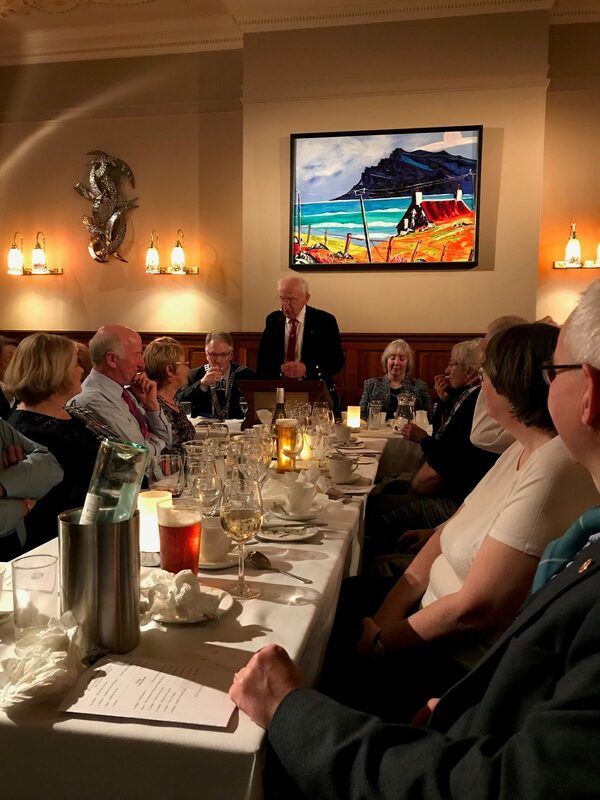 Well……, as if that wasn’t enough of a laugh we were then treated to two hugely entertaining speeches by husband and wife, Allan McWilliam (toast to the lassies) and Lynn McWilliam (reply on behalf of the lassies). The wife can never be wrong. If the wife is wrong it is due to a misunderstanding which was the direct result of something the husband said or did. The husband may be right if he agrees with the wife (unless she wants him to disagree). Lynn emphasised that, despite much misheld belief to the contrary, Burns had been a great believer in the rights of women and she acknowledged that ‘a man’s a man for a’ that’. Colin Vooght delivered a much-deserved thanks to everyone.